Everyone’s favorite 5 knob fuzz, with custom hand drawn Sharpie design. 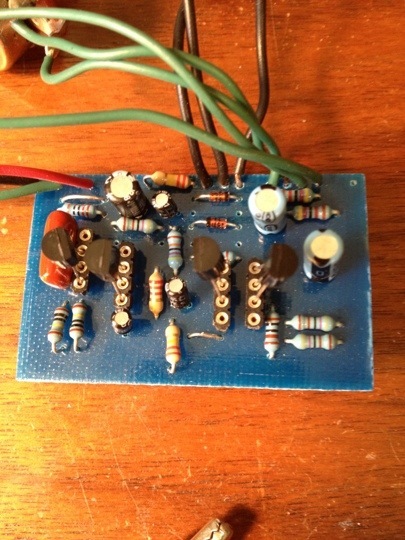 A four knob Si Fuzz clone. With custom Sharpie design. 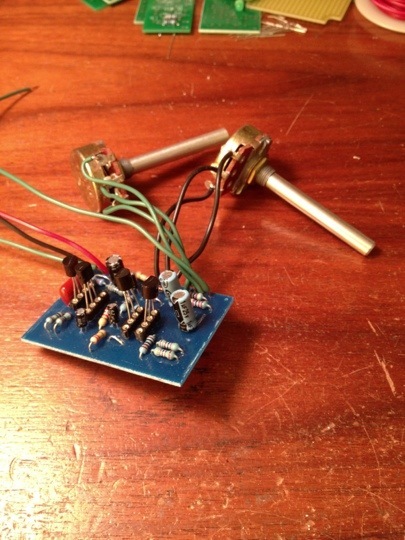 Here’s a clone of the Zvex Wooly Mammoth. Came out pretty good, sounds good too. I used strip board layout here: http://www.freestompboxes.org/viewtopic.php?f=7&t=4&start=40 It’s about halfway down the page. I modified it to move the parts closer together. My layout ended up being 17 holes wide which fit in the box a little better. I used a small hex bolt and a standoff to secure the PCB in the box. Note the “mojo” ceramic disk capacitors. I housed everything in a box from 4Site electronics. These are great boxes the finish is very nice and the screws are much higher quality than the Taiwanese boxes. I made a mistake and couldn’t fit the DC jack in the center at the top, where I had drilled the hole. So I drilled second hole and used a piece of brass to cover the first hole. I’m trying to think of some way to stamp something into the brass plate so it will serve some purpose beyond covering the error. I have a few spools of hook up wire from Radio Shack. This stuff is terrible. The insulation melts. I would not recommend it. Whenever I build something I usually build two. The parts are cheap. If I make a mistake or the PCB doesn’t etch correctly I have a spare. If you build the first and it doesn’t work you can build the second and compare the two. 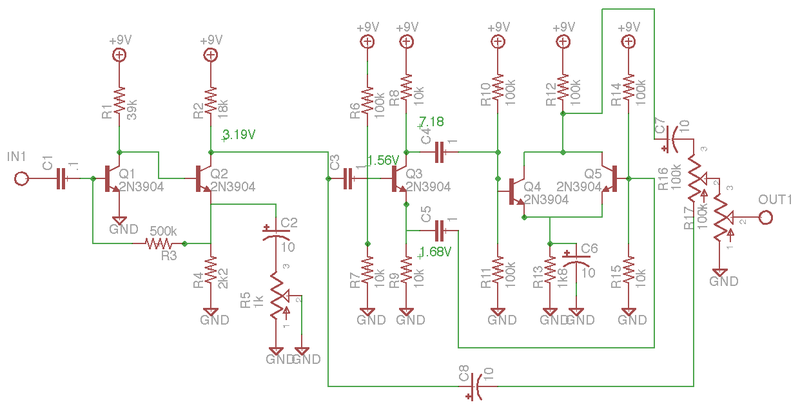 In the case of the Silicon Tone Bender I used Nocentelli’s strip board layout, which worked well. I built two as usual. 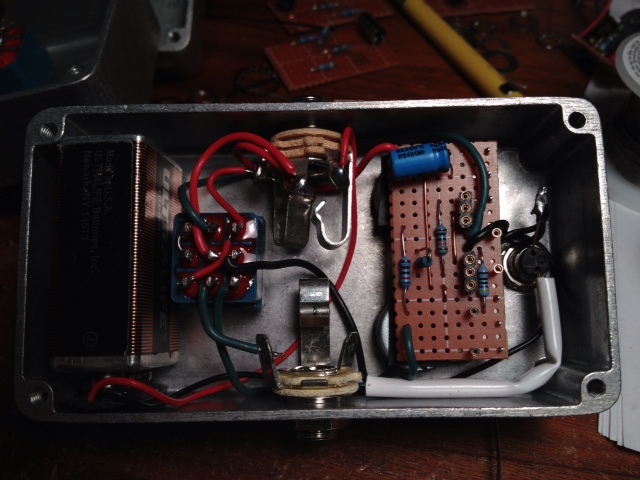 I thought the first sounded good so I thought I’d build the second and box it up. Lately I have been trying to use up extra parts I had lying around. I found a box with an etched top that I hadn’t used. This box was originally going to be Big Muff variant, but the box was over etched. So it was never finished. The design included three controls: Volume, Tone and Gain. which worked out for the Tone Bender. I decided to add the Fat switch on this one so I drilled an extra hole. I soldered the “fat” cap to the switch and ran a wire to the switch and the PCB. I used a Green LED and some Knobs I got from Futurlec. These knobs seemed like a good deal at the time. But it turns out that the hole is too small for 1/4″ shaft. They will fit on a knurled press fit type shaft. I hardly ever use those so these knobs had sat in the knob drawer for while. I finally decided to get rid of them with this project, so I sanded the shafts down until the knobs fit. notice the PCB is mounted on a small hex bolt. I used a nylon standoff. This worked pretty well. I’m guessing it will stand up over time. The small nut has a nylon lock ring in the end. 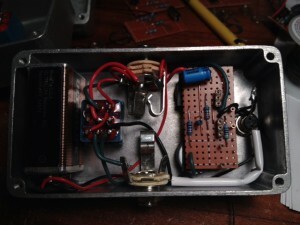 I built this Silicon Tonebender posted by mictester over on Freestompboxes. I used this layout. Everything worked the first try and it sounds good. I used BC109CN for transistors. These sounded good and have that metal can with a little tab mojo. I used a ceramic .1µf cap for the input cap and skipped the Fat switch. The fuzz is so thick you can cut it with a knife. The tone control is useful. Everything cleans up well with volume control. Would I box it up? Heck yeah! This is a keeper. No need for expensive hard to find Ge devices. I think I might have to get a few more of these metal cans just for their mojo. If I had any complaints I would say that the Gain control lacks range. You really can’t back this off to a mild fuzz. When the effect is on you know it. This also gave me an opportunity to use some poor quality trimmers that I had lying around. I used sockets to experiment with different transistors.